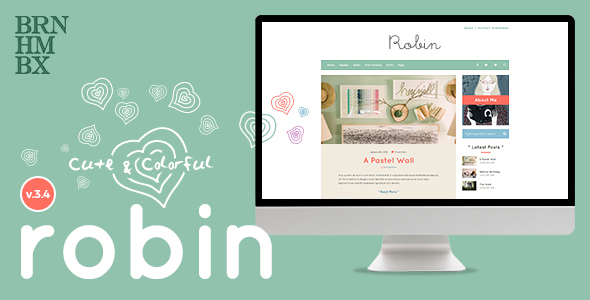 Robin is a cute & colorful blog theme for the creative ones who interested in handmade items, cooking, illustration or any other hobbies. Besides, it’s a quite unique theme especially in the name of color usage. Don’t hesitate to drop a comment. We’re keen to improve Robin with your thoughts! + A bug fixed where the logo font doesn't take effect on WooCommerce pages. + An option added for the mobile menu parent item click actions. + New Google Fonts added: Gaegu, Stylish, IBM Plex and Jua. + New Google Fonts added: Faustina, Mina, Nanum and Sedgwick. + Google Font "Barlow" added.